Selling a good product doesn’t necessarily make you a good salesperson. But needless to say: it certainly helps. If you are selling a good product, you can easily advise your customer to do exactly what you would do yourself, as if you were standing in their shoes. In other words, it greatly helps to build genuine ‘rapport’ with them. Of course, you could use other techniques such as urgency creation or provocative selling. But without a product that adds value, you’re going to have a bad time building a sustainable relationship with your client. No need to elaborate on different sales strategies and techniques, as there are enough good sources and experts like Michael Humblet (Chaomatic) or Steli Efti (Close.io) on that subject. 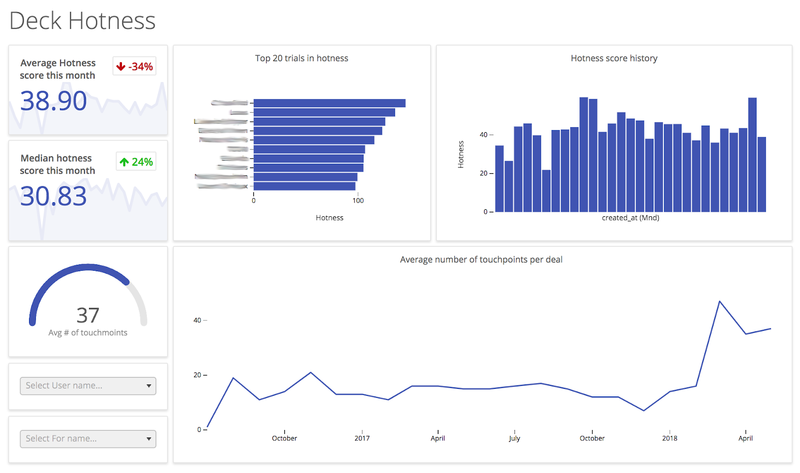 In this article, I would like to share how we, as an analytics company, use data and dashboards to sustain the growth of a scaling company and sales team. At present, almost every industry generates data. As a result, more and more companies start to realize the necessity to start working with this potential treasure of insights. As a sales manager of an analytics company, that means I get in touch with a multitude of different industries, profiles and people who want to do more with their data. The challenge? Every single one of them has different needs and use cases. And that might be the thing I love most about my role: being in contact with these clients or prospects, understanding their needs and translating them into specific solutions using our platform. The more cases you solve as a company, the more out-of-the-box solutions you can use in the future to create value for your existing (or future) clients. But many times, we’ve seen clients come up with a creative solution of their own, asking us for feedback on their ideas. I love it when this happens. Especially if we know another client who might benefit from this too, or when it’s a sales related case and we can implement it in our own processes. Inevitably, I’ve learned a lot about analyzing sales processes. Not only within our own company, but also while working with customers who are trying to get a grip on their sales process. Your CRM system is usually the best place to start. It contains all the data that’s also most important to me, as a sales manager: our leads, customers, the sales stages they are in, actual and projected revenue, and I could go on for quite some time. Bringing those together in structured sales dashboards will help you and your team a lot. To give you some context: we are a scaling SaaS company with a relatively complex sales cycle (multiple offerings). We use Teamleader as our CRM platform (they have an awesome team behind an awesome product). In addition, we have experience with Pipedrive (of which I’m a big fan too) and Hubspot (which is great for the marketing/sales link). We have upcoming integrations with Close.io and I hope to see one with Salesflare too in the near future (as they’ve built a promising and awesome platform in the past years). 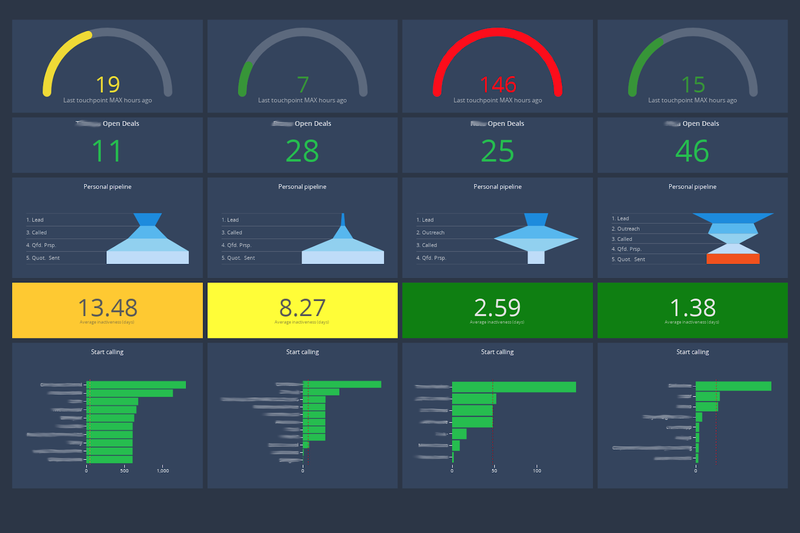 The Holy Grail for perfect sales dashboards? There is none. Thus, in no way I’m meaning to say that the metrics we’re about to discuss will work for every company, for every sales process or with every CRM platform. Even our own setup is still highly dynamic. We regularly make changes to our sales dashboards, based on our current sprint, our team size, our current challenges or when new possibilities arise thanks to improvements in the CRM plugins. More data = more possibilities. Moreover, I don’t want to re-list the essential metrics everyone in sales should already track, like weighed revenue, close rate, … as there are enough good sources for basic sales metrics too. What I do want to share, is a toolbox of ideas, tips and tricks that worked for us, as they might prove useful for other sales managers too. In addition, I want to show you how your own creativity is the key to your success. The overall level of creativity you can put in your sales dashboards can do unimaginable things to your business. These sales dashboards – or similar ones – might only streamline your sales process just a little bit. But in the long run, and added together, they wìll have a positive impact on your overall sales figures. Yes, even with just limited data in your CRM platform. Furthermore, I want highlight that most of these are quite fast to implement and don’t require an (expensive) data scientist to set up. So, let’s head on to the dashboards. Some of our most actively used sales dashboards are our ‘assistant dashboards’. They show us the situation of our pipeline, sales process and action points, for each sales rep individually. In most of these analysis, we use a concept we call ‘Touchpoints’. A touchpoint is any action we can link to a specific deal. Like an email sent/received, a chat conversation, a phone call or a meeting. It always has a specific date related to it. Internally, we have some guidelines on actions to be taken on deals in a specific phase. For example, we try to have a touchpoint with every new trial/deal within the first 48 hours. This way, we can understand his needs and goals and point this prospect in the right direction. We can also suggest a personal onboarding session with a colleague of the Customer Success team. All of this translates itself into a specific sales dashboard, set up with filters per employee, which can visually help each our colleague to be on top of their pipeline. Internally, we don’t do micromanagement. And we surely don’t track the history of these dashboards to use them in employee evaluation. We use these sales dashboards solely as motivation or assistance as they almost literally can speak: ‘hey – start reaching out, Bruno’. This simple object shows the MAXIMUM value of the number of hours that a new deal hasn’t been contacted yet. As we require new leads to be contacted within 48 hours, we set the target at 48. So, the gauge will turn red when one of your new leads it is overdue. This gives you a very clear indication that you urgently need to make time for your follow-up emails or calls. Again a barometer to show how active you are on contacting your deals. If this number is higher than average, some deals might be frozen (maybe to death). Or, you should urgently make time to reach out to your prospects. Together with the number of deals, this gives a visual distribution of the individual deal & pipeline distribution. If one colleague has 40 deals and a second one only has 8; a transfer of owner might be in everyone’s best interest. The same goes for the funnel distribution. If one colleague had 70% of his deals in the initial stages and another one has most of them in the late stages, a swap of deals might be relevant. We’ve been using this sales dashboard since the very start of our company. It kind of feels like an life-long partner in crime. It shows the evolution of some of the most important sales metrics such as close rate, avg days to close, deal source, reason refused, … As a date dimension, we usually select the measures’ corresponding date column (e.g. Creation date for # of new deals, Date lost for Reasons refused, Date Won for Revenue per source, …. ) and we usually do our analysis per quarter. 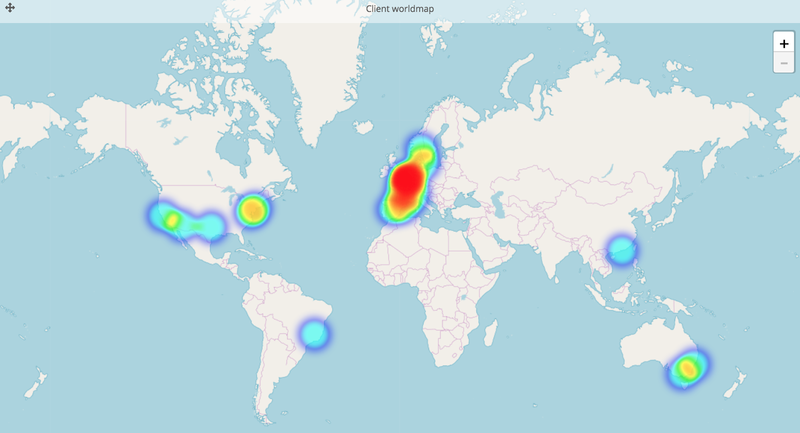 We rotate a world map with global locations of our current clients at the office. Why? First and foremost, it looks awesome. Secondly, it constantly reminds us of our international aspirations. It motivates everyone in the company to open up new markets in new regions. In addition, when one of us plans an on-site visit with a prospect or client, we can do an easy check whether there are other clients situated nearby, so we can pay them a courtesy visit. This greatly helps the relationship building with our customers! Another sales dashboard we actively use is our expected cash flow dashboard. As a sales manager, you’ll want to know which revenue you’ll get out of your existing pipeline in the coming month(s). Some CRM platforms offer such a prediction analysis. However, I noticed that a forecast is always very specific to the company itself. Thus, it needs some tinkering for each specific case. Although many CRM platforms allow you to specify the probabilities per phase, or to manually insert the expected close date per deal, we prefer to use calculation based on historical trends, as it requires a lot less manual input and maintenance of your CRM system. Historical Probability for Phase X = (# deals that ever went through phase X and are now WON) / (# deals that ever went through phase X and are now WON or LOST). As a date dimension, we select the ‘(Expected) Close date’. To calculate this date dimension, we use the actual ‘won date’ for a won deal and the expected close date for open deals. To calculate this expected close date, we looked at our historical ‘days to close’ per license type. As in our specific case, we saw a high correlation between the two of them. An alternative is to use the ‘phase’ as a variable again, and calculate the average days it takes to close a deal after it got in this phase. Extra tip: when grouped by ‘Open or Won’ (the second dimension), it shows you the distinction between already confirmed deals and the expected deals. In that way, you’ll have a better insight into what’s 100% sure, and what’s calculated on probabilities. We loop this sales dashboard on our dashboard carousel on the big screen in our office. This way, we have an indicator on the current status of the pipeline at all time. In other words, we know if the current pipeline will suffice to reach our target that month. If it doesn’t, we can directly take action. When we’re at the start of the month, and we’re low on leads, the marketing team will launch new campaigns on specific target groups. When we’re at the end of the month, it means we as a sales team have to do an effort of closing late-stage deals faster than average (e.g. by increasing our pre-sales effort). The (relative) number of Touchpoints: a high number of touchpoints with prospects can indicate whether your current trials are engaged with the (pre)sales team. This might indicate a higher number of questions/inquiries by the prospects. Thus, a higher chance of being qualified as a potential client. Platform usage stats: for obvious reasons, such as ensuring a stable and performant platform, our OPS/product team logs statistics on platform usage, number of sessions, number of queries sent, … Most of these metrics are flagged as ‘existing client’ vs ‘trial user’. We, as a sales team, use this information as a proxy for trial ‘engagement’. We combine both concepts in something we call the ‘Deck Hotness score’. This is one single number on an arbitrary scale that can give an indication on how likely it is that a trial will convert into a paying customer. It is important always to use relative variables (e.g. the average number of queries generated per active trial). The dashboard also rotates on our screen – right after the cashflow projection – so we have an idea about trial engagement at all times. A lower than average trial engagement might mean that we will undershoot on our expected revenue for that month. So we might need to up our effort to generate trial engagement (e.g. by organizing a webinar on a specific subject). Be creative with your data! As I already mentioned, I am not the next sales guru who’s telling you how to do or how to track your sales. When it comes to your own business, you are the true and only expert. Like no one else, you will know best what’s working well in your company. What I do hope, is that our example cases have inspired you to be creative with your own data. Firstly, to be creative in setting up the right sales dashboards, with KPIs that support your business goals. Secondly, to be creative in finding solutions to the things your data is telling you. For us, it really changed the dynamics in our team, and the way we do business. What about you? 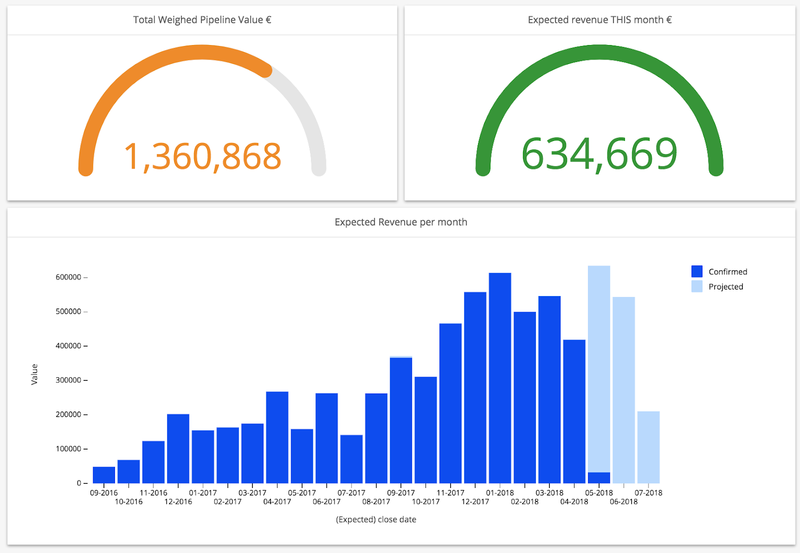 Are you already using sales dashboards in your company? Do you have some cool examples of dashboards you’d like to share with other sales managers? Would love to hear your ideas and thoughts in the comments! If you want to get started with the sales dashboards discussed above, don’t hesitate to get in touch with me. You can also start a free trial on our platform; my team members will reach out to you if you’d need any help. Good luck, and happy dashboarding! Are small companies the real analytics champs?